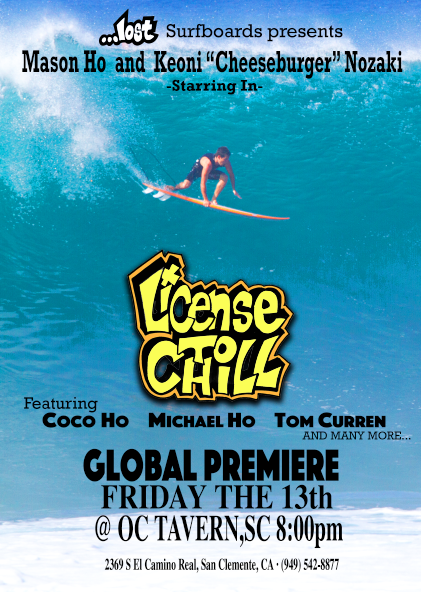 …Lost surfboards presents LICENSE TO CHILL. Starring Mason Ho & Cheeseburger in a 6 or 8 part series that also includes the likes of Michael Ho, Coco Ho, Tom Curren and many more… Filmed over the last three years and featuring more closeout barrels than air reverses. Follow the dynamic duo as they march to the beat of their own drum on a quest for fun. Global premiere May 13th at the OC Tavern in San Clemente around 8 PM. World wide web release May 16th on lostenterprises.com, lostsurfboards.net, burgerinparadise.com and surfline.com.